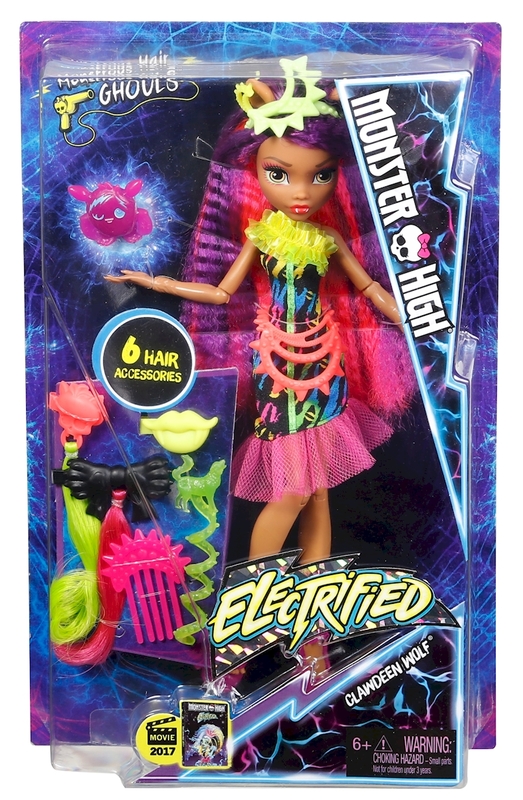 Amp up the fun with the Monster High™ Electrified hairstyling dolls! Clawdeen Wolf™ doll has monstrous hair, six cute accessories and a beastie friend figure for hair-raising fun. Bolting off the movie screen in bold looks, bright makeup and multi-colored hair, these ghouls are ready to chase their dreams and light up the world -- and do it all with fabulous hair! Use the accessories to create clawesome looks, take them down and start again. Clips, colorful hair extensions and hair ties with neon colors and iconic shapes -- like a wolf, a Skullette™ or moon perfect for the daughter of a werewolf -- mean you can style with so many possibilities. 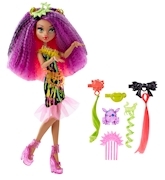 Clawdeen Wolf™ doll wears a stunning dress with a multi-colored graphic print and pink tulle trim that really brings the look to life. Neon jelly accessories, including pink shoes and an orange studded belt, are electrifying. And a voltageous hairdo with colorful streaks is fierce fun to style. Recreate a hairstyle from the movie or spark up your imagination with lively looks of your own! Create one clawesome hairstyle, then take it down, comb it out with the included comb and style another. Collect all of the Monster High™ Electrified dolls for even more energetic play (each sold separately, subject to availability). Includes Monster High™ Clawdeen Wolf™ doll wearing fashion and accessories, six hairstyling pieces and a beastie friend. Doll cannot stand alone. Colors and decorations may vary.